1. 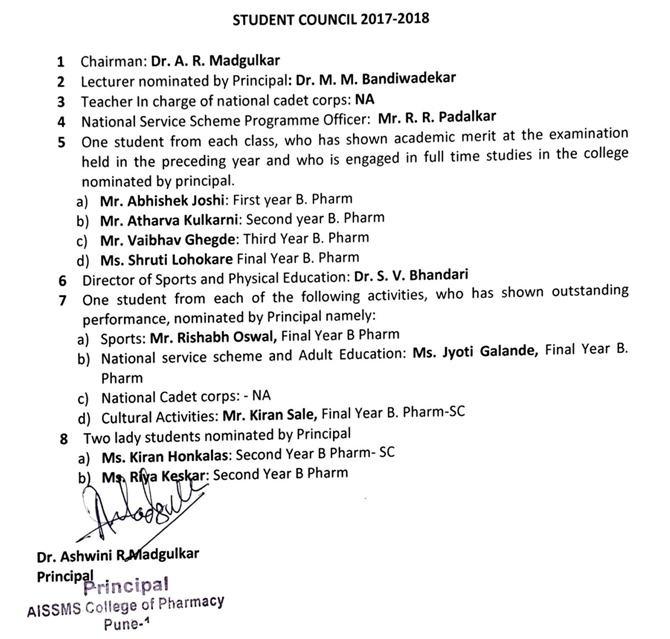 Student Council: Student council is constituted as per the University norms. The course monitoring committee is composed of Academic InCharge, M.Pharm. Co-ordinator, B.Pharm. Class teachers. and student class representatives from each class. To inculcate a habit of sportsmanship and importance of discipline and punctuality and also to improve working in a team and learn to handle tricky situations thereby building up decision making ability sport event arranged every year. This helps students not only to keep their physic fit but also makes their minds strong. Committee members are selected from every class. For the organization of various cultural events, the cultural committee was formed. This committee along with the in charge faculty members plans and encourages students to display their inherent qualities. This in turn also extracts maximum potential of the individual relating to leadership qualities, strategy and time management. One girl and one boy are selected as cultural representatives from each class respectively. The committee arranges educational trips to various places and visits to pharmaceutical industries in order to enable the students to broaden their horizon. APGA stands for AISSMS Pharma Graduates Association, a student’s association, which helps the students to place themselves successfully in future in various, reputed institutes of India and abroad. It also provides various job avenues by connecting to our various ex-students present in different parts of India and around the world. At the same time, they also aid in finances & references required for pursuing higher education. They also help in enlightening the students by regularly arranging workshops and seminars by eminent personalities in their respective professional fields. 3. Mr. Hrushikesh Sonaikar Final Yr. B. Pharm. 4. Mr. Vaibhav Ghegade Third Yr. B. Pharm. 5. Mr. Saurabh Rohom Second Yr. B. Pharm. 6. Ms. Samruddhi Pande First Yr. B. Pharm. 7. Ms. Shivani Jadhav Second Yr. M. Pharm. 8. Ms. Nishigandha Yadav Second Yr. M. Pharm. Class Representatives- A class representative is a person (or multiple persons) who is similarly situated to the other members of the class, who has interests typical of the rest of the class, and can fairly and adequately represent all the other members of the class. Class representative is the best mediator between a class teacher and all other teachers. We have two class representatives (one boy and one girl) for each class.